Do you know what sets Giftwrap apart? It is our ability to come up with something which is unique, affordable, and has a very high utility. 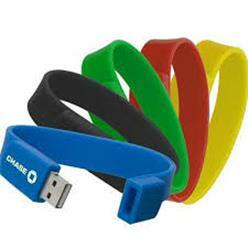 The USB memory stick wristbands are such a thing which serve dual purposes. The people are going to get a fashion accessory along with an electronic device. Can it get better than this? Absolutely no! Coming at affordable prices, these wristbands will help you in carrying all the necessary information wherever you go. This is such an item which will attract the youngsters and the mature audiences alike because of its versatility. There are different colors available at Giftwrap and the entrepreneurs can choose one according to the design and logo of their company. The silicon wristband has the highest quality and is very durable. If you want to provide such an item in your promotional campaign which will last for a considerably long period of time then make this USB memory stick wrist band your final choice at Giftwrap.